Addiction to any thing is an abnormal behavior that eventually leads to health as well as psychological disasters. However, actions and behaviors that are done occasionally or out of professional ethics are not categorized as addiction.Therefore, addiction is basically a disease. At the same time, there are many behaviors and actions that are adopted due to professional ethics or depending upon the person's mood to get into occasionally behaviors. Such actions and behaviors develop into a habit and eventually lead to addiction. For instance, smoking and alcoholism even if done occasionally or out of professional ethics in some business meetings or family celebrations are a threatening source of being habitual and eventually addicted. On the other hand there are many social as well as psychological reasons that an individual involves into such habits like smoking and drinking. However, these causes vary from person to person depending upon their age groups and environmental factors. For instance, the reason for a teenager to adopt the habit of drinking alcohol might be either due to the family environment as an influence of his/her parents, which are addicted to alcohol or inherited biologically or due to some personal or physical and psychological frustration. The very symptoms of alcoholism includes craving to drink, loss of self control where a person is not able to limit himself to drink in any occasion, physical dependence in which a person often undergoes feelings like nausea, sweating, shakiness and anxiety. Generally such symptoms are noticed when a person is trying to control his addiction to alcoholism after a period of heavy drinking. Another symptom of alcoholism is the ability to tolerate less amount of alcohol. Though, alcoholism does not have much to do with the will power of an individual that is addicted to alcohol. However, medical treatment and family support can play an important role in limiting addiction to a habit and then to a normal behavior ultimately resulting to complete avoidance of alcohol. On the other hand it is also observed that domestic violence and abusing the self-respect and moral and human rights of an individual due to absence of self control and abnormal mental temperament are caused due to alcoholism. It is but natural that an individual that is habitual to heavy drinks, he loses his mental activeness and do actions that he would never do being mentally normal. For instance, according to a research conducted by the American psychological association, men who are addicted to alcohol posses a stronger tendency towards physical violence to their female partners then the days they are not drinking alcohol. At the same time, the researched also concluded that the subsequent violent behavior of men towards their spouses is basically due to their addiction to alcohol. When a person is addicted to alcohol, two important things happen the first thing is the actions and symptoms of an alcoholic person when he is deprived of drinking for few days, as he becomes frustrated, irritated and violent. Where the other condition is the days when an individual is in regular drinking phase. In these days he loses his mental control and becomes violent. However, in both the conditions, an alcoholic person performs actions that are morally and ethically wrong and at the same time all these actions are not preplanned or intentional therefore, such actions a person never does if he is in a normal condition. Therefore, any action done unintentionally harming the moral, ethical and human rights of another individual and at the same time his own mental and physical health is directly related to mental and psychological abnormality, which is a disease. Thus this mental abnormality can also be recognized as mental illness. 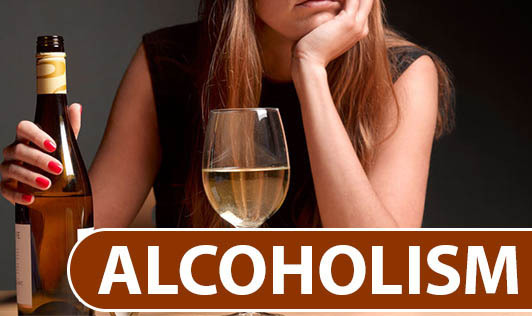 Therefore, alcoholism is not only a mental and psychological disease but also a physical disease as it damages the nervous system and also causes to many internal injuries, which ultimately results to either cancers or any other life taking diseases. However, people who are addicted to alcohol live in an illusion created of their own that this is their idea of mental and emotional relaxation and means to gain physical pleasure. Nonetheless, this is not true and just a misconception, as alcoholic patients do not accept the fact that it is harming them by all means.